Need a new idea for what to do with those turkey-day leftovers? Sneaking in a spa getaway before the holidays is easier than you think. 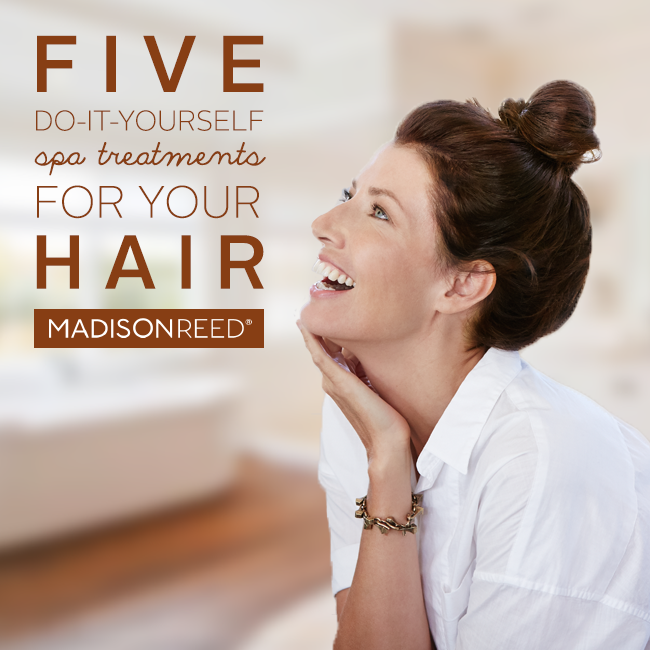 Madison Reed wants you to know about these 5 swanky spa treatments for your hair. The best part? These deliciously healthy hair solutions can be found in your own kitchen! Believe it or not, beer is full of protein, which enhances shine, strength, and moisture. HOW: Just open up a can or bottle and let it sit open for a couple hours to release the carbonation. After you shampoo, gently massage the beer into your hair, let it sit for 5-10 minutes, and then rinse. You can also put the beer in a spray bottle and spritz onto dry hair. The protein residue from the brew will help strengthen your hair. Don’t worry, we’re not leading you into a sticky situation, you can safely put honey on your hair! In fact, it can be a miracle worker for damaged hair. Honey is antibacterial, contains vitamins and minerals, and is a humectant, which means that it attracts moisture to improve dry hair. HOW: Using half a cup of honey, saturate your hair. Put on a shower cap to capture natural heat and put your feet up for half an hour (you deserve it). Rinse out the honey to reveal glowing soft, silky hair. This treatment will help reduce split ends and fly aways. Time to apply our science class know-how to hair care! Baking soda is an alkaline base (the other end of the spectrum from acids). This is important for hair because excess oils and styling products get trapped in the cuticle of your hair, making it feel greasy and flat. Use baking soda to lift out those unwanted oils and product build up. HOW: Mix two tablespoons of baking soda with small amounts of water until it forms a thick paste. Work this paste into your hair and let it sit for ten minutes before rinsing. Your hair will gain volume and feel bouncy and clean! The oils in avocados are very similar to the natural oils in our skin. Combined with its proteins and nutrients, this is one hair-enriching fruit! Use as a smoothing balm to tame frizz and fly aways. In winter months, it can also reduce that annoying seasonal static. HOW: Mash half an avocado until smooth. Massage into damp hair and leave it on for 20 minutes before rinsing. Your hair will be deeply conditioned. Bonus: if you have curls, this treatment will make them soft and defined. Yogurt does wonders for dull, lifeless hair. It contains lactic acid, which gently cleans off the environmental film that can build up on our hair, and milk fat, which adds incredible shine. HOW: Massage a half cup of plain yogurt into damp hair. Put on a shower cap to capture natural heat. After 20 minutes, rinse your hair. Your hair will look like it’s glowing! Treat yourself to one of these kitchen spa treatments once a week on rotation to relax and get healthy, gorgeous hair. Follow up with Madison Reed Radiant Color Kit that is healthier for your hair for a full beauty routine that leaves you feeling great, inside and out!